BOWMAN, Alexander Hamilton(1803- 1865) was an engineer, military educator, and career officer in the United States Army. Bowman supervised the erection of Charleston Harbor defenses, including Fort Sumter, and served as Superintendent of the United States Military Academy at West Point, New York during the American Civil War. 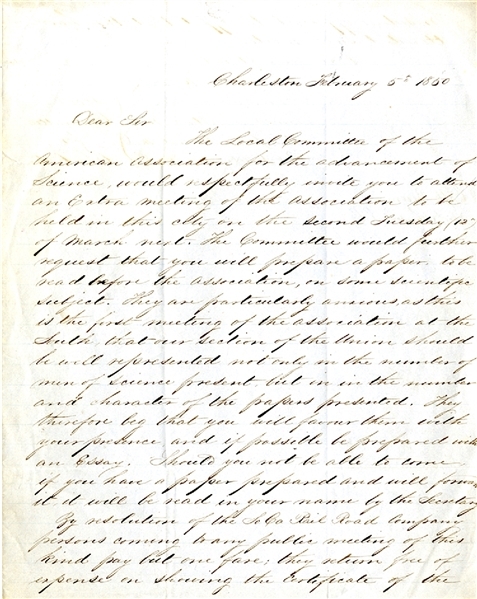 Manuscript Letter, 2pp. quarto, Charleston, South Carolina, February 5, 1850 addressed to Captain Bowman by the Local Committee of the American Association for the Advancement of Science inviting him to an extra meeting of the association. Fine condition.